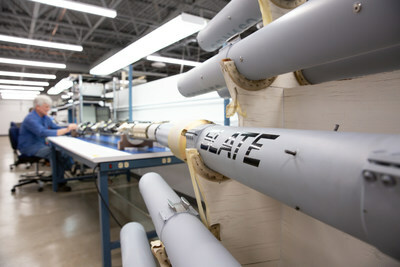 SAN DIEGO, Jan. 25, 2019 /PRNewswire/ -- Cubic Corporation (NYSE:CUB) today announced that it is completing the renovation and upgrade of its San Diego manufacturing facility to accommodate the production and testing of components for pods, ground subsystems and secure components for its live, virtual and constructive (LVC) air combat training systems. Due to Cubic Global Defense's recent success in the Secure LVC Advanced Training Environment (SLATE) Advanced Technology Demonstration (ATD), its facilities are being readied to perform the final assembly and testing of its new secure LVC pods. "Cubic's Air Ranges team has worked very hard to develop LVC-enabling technologies to successfully demonstrate the efficacy of blending virtual and constructive entities into live aircraft cockpits," said Mike Knowles, president of Cubic Global Defense. "We are thrilled with the latest enhancements to our manufacturing facility and look forward to strengthening and increasing the production of our new secure LVC pods here in San Diego." Cubic invented air combat maneuvering instrumentation (ACMI) in 1973 and has been producing and delivering systems ever since. Overall, Cubic has delivered over 5,000 pods for 40 different aircraft at 80 locations worldwide. In the last decade, Cubic has delivered 2,000 P5CTS/TCTS pods to 17 countries and 30 training ranges. In addition to P5, Cubic operates a KITS ACMI pod production line and has delivered 640 KITS pods, with 50 ground stations and sustainment to the U.S. Air Force, Canada, Japan, Saudi Arabia, Indonesia and Thailand. Building upon three years of KITS production backlog, capacity for the new secure LVC pods and ground systems leverages current workforce and technical acumen. Cubic currently has three manufacturing centers in the U.S. and Mexico, all with established and active supply chains, that specialize in various components of its ACMI pods and LVC system. Facilities at Cubic's San Diego headquarters have been upgraded to provide secure production and will serve as the main manufacturing hub for Cubic's LVC air combat training systems.